I recently took Darcy’s Whole Novel Workshop and read her book, Novel Metamorphosis: Uncommon Ways to Revise. Between the two, there was a great deal of valuable new information to process. I’m very visual, so one way I worked through and organized the information was by creating charts. To what are mostly Darcy’s ideas, I added a few of my own, and some I’ve learned in other workshops. Darcy has asked me to share these charts here on her blog. 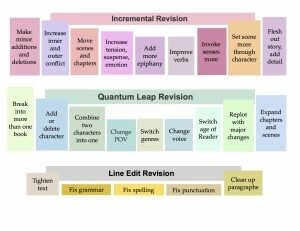 The first chart is The Novel Revision Chart. As Darcy teaches, there are many types of revision to consider once we have a draft of a novel. This Novel Revision Chart show the different types of revisions and helps you prioritize the revision tasks. CLICK TO VIEW FULL SIZE. Darcy’s workshops are based on critique groups. Participants work in groups of four, reading and commenting on each other’s manuscripts and. Taking the three critiques of my novel, I made a list of all the types of revision my group suggested for my novel: not letting the tension flag, pulling all my theme threads all the way through the novel, keeping my character age-appropriate, etc. 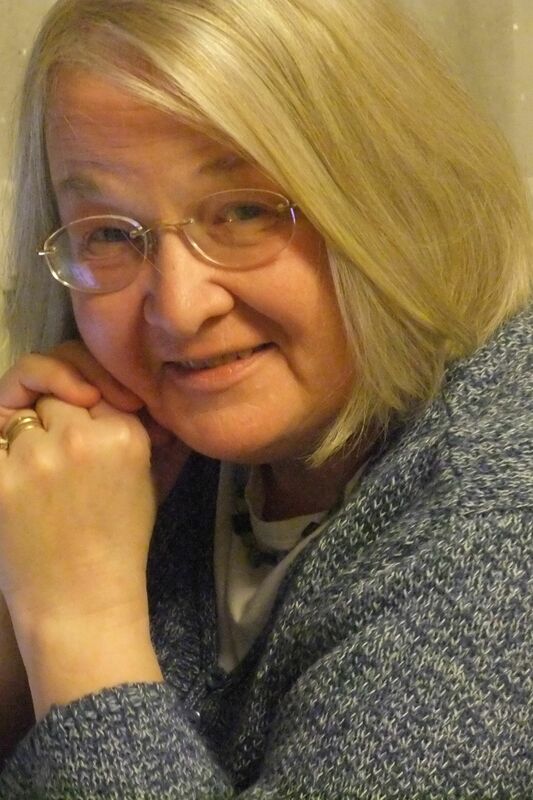 The Darcy Pattison Novel Revision Retreat will come to the Boston area in August, 2014. There are a limited number of spaces still available. See Anne Broyles site for details. Also available is a Build Your Website session and a Picture Book Workshop. Hurry! Spaces limited! And time is short! Then, I identified where these types of revision landed on the Novel Revision Chart. If they landed somewhere on the Incremental Revision line, I figured I could work with what I had already written. The three types of revision mentioned in the previous paragraph all land there. If, however, the needed revisions landed on the Quantum Leap Revision line, then I figured maybe I should scrap this chapter or that and write it again from scratch. Or write the whole novel again in a new draft. Or take the novel apart and reorganize it in some major way. For instance, my second novel is probably really three novels. (Sigh.) But better I realize that now than waste time trying to fix it the way it is. The point is, this chart can help writers identify how major or minor the next revision needs to be, as well as what kind of revision needs to be focused on next. It can save us spinning our wheels on the wrong kind of revision. How many times have we worked on verbs or sensory detail when what we needed was to introduce another character or change the beginning? Trust me: been there, done that, and it’s very annoying to realize I should have been working on a totally different kind of revision. The chart can make us smarter revisers. 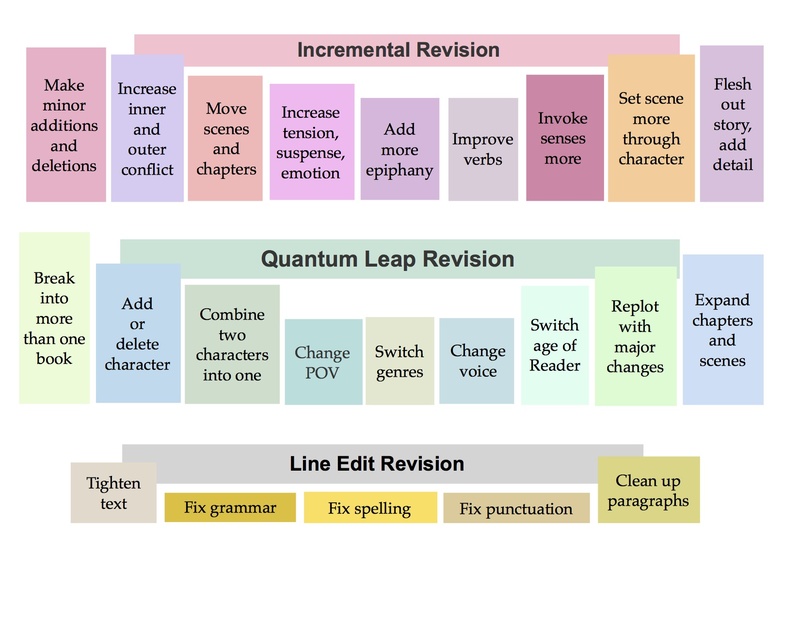 The Line Edit Revision part of the chart is a reminder that the final revisions you do, once the novel is firmly shaped and sparkling with life, and just before submission, need to be these five types of micro-edits. Therefore, it is at the bottom of the chart. But before we do any line editing, there’s the second chart to look at, A Checklist for Each Scene. 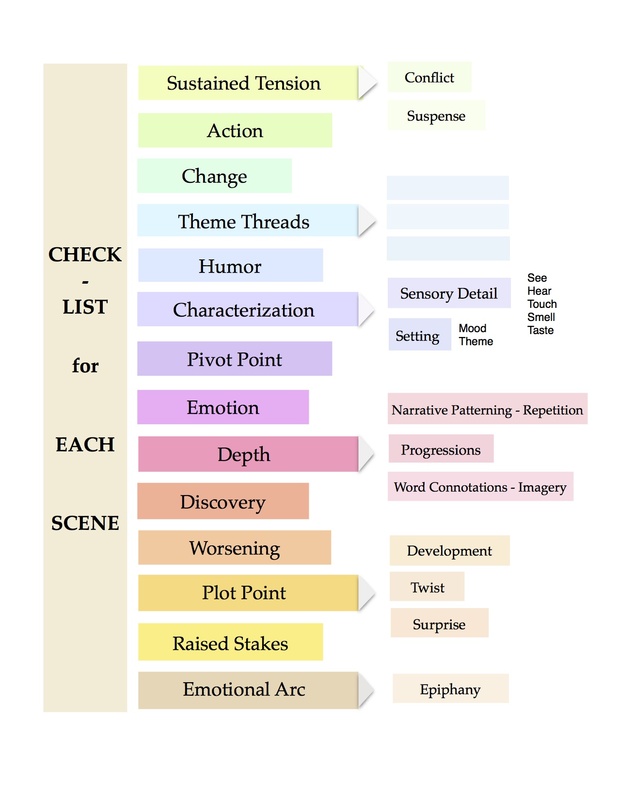 As the first chart is a way of evaluating the revision needed overall, this second chart is for scene by scene revisions. As Darcy explains in Novel Metamorphosis: Uncommon Ways to Revise, each scene is a kind of whole of its own. 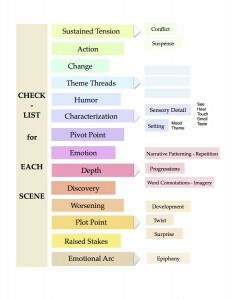 Taking one scene at a time, a writer can use this chart in conjunction with Darcy’s book to make sure each scene includes all the elements required to create a tight, compelling scene that propels the reader into the next one. After the major revisions and before the minor Line Edit revisions, you should do a scene check. CLICK TO SEE FULL SIZE. I have these charts before me as I work. They are quick reminders of each step needed to flesh out and deepen a scene and ultimately write a novel that editors will want to publish because they are so rich and satisfying a read. I’ll make checks on the charts as I go, when I think I’ve accomplished each type of revision. And when I’m “done” I’ll put a big exclamation mark in sharpie marker, or a smiley face, or perhaps I’ll save them for the next novel. Claudia Finseth is a writer and author living in Tacoma, Washington. She is published in non- fiction adult, poetry and short children’s stories in Cricket Magazine. Her goal now is to become an adept at the novel form. “Novels are hard!” she says. Her website is claudia.finseth.ca. Thank you for this article and especially for the charts. I am teaching myself the art of novel writing as I go. these are invaluable tools for me.